7553 AT (Alternative Timeline): Forget all the things you know about the Middle Ages. Explore a parallel reality where magic changed everything. T.I.M.E. Stories: A Prophecy of Dragons is the third T.I.M.E. Stories scenario. 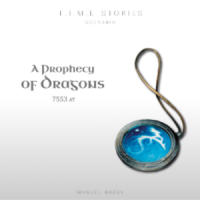 Add a Review for "T.I.M.E Stories: A Prophecy of Dragons"